A traditional block folding model. This is a very simple diagram with at least two variants; the blue and green turtle is from the main diagram and the smaller one, in earth tones, is the variation one. The base piece is the same for all block folding diagrams. These turtles are assembled almost identically to the fish; the main difference is how the “paws” are joined in between the assembled body pieces. The assembly varies a little for the two turtles! Almost not noticeable. Once again, this model does not need glue but you can use it to enhance the models’ resistance. 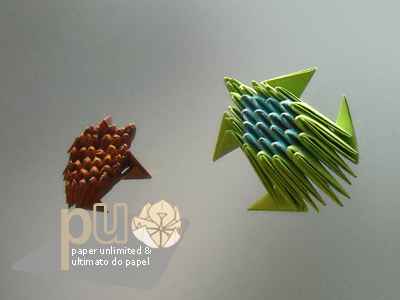 The blue and green turtle was made with office notes, the ones without glue and the smaller one with some heavier and patterned paper. And smaller size pieces too. The diagram is very simple and only has the assembly diagrams, for more on how to fold the base piece, please check the block folding fish diagram out. 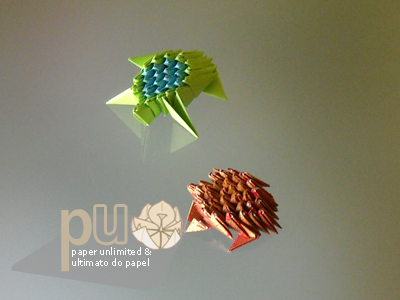 This entry was posted on 2010|11|23 at 00:15 and is filed under block folding, diagrams, origami. You can follow any responses to this entry through the RSS 2.0 feed. You can leave a response, or trackback from your own site.